This fall marks the 20th anniversary of the release of my first CD. So, here’s what we’re going to do to celebrate. If you’ve seen me in concert over the years, you’ve likely seen me with mulit-instrumentalist Spencer Capier. The two of us (along with our pal and producer Roy Salmond) are going to do an acoustic project re-recording 10 songs from the last 20 years (plus a new one). We’re going to give it away as a free download as our way of saying “Thanks” for the past two decades of support and connection. 1. Songs that you feel have been overlooked in my catalogue. 2. Songs that you’d particularly like the next generation to hear. 3. Songs that you would like to hear rendered in a more stripped down, acoustic style. Feel free to refresh your memory by perusing the discography below, and then please share your suggestions (and the rationales behind them) in the comments section. We can’t wait to hear your ideas, and we stand at the ready. Go HERE to get the full story behind the project. “Feel Free,” “Everybody Wants Everything,” and “Life is Long.” This is fantastic that you are going to be recording this project. Thanks for these 20 years! I am so grateful for the words, the music, the reviews and the blogs. Thanks forever! There are so many songs, but my first real ‘Carolyn moment’ was a time when I had been distracted by life. The still small voice spoke, “Hey! Remember me?”. My faith had been reduced to the bumper sticker on my truck and the obligatory Sunday morning corporate liturgy. My response was to replace what I was listening to with something ‘spiritual’. I ejected the classic, probably Abbey Road, and reached for something from the other end of the case. “I can hear you”, by some new artist, Carolyn What’s-her-name. Popped it into the player and began to sing along as best I could. The tracks were refreshing. A couple of tracks in came “Ya Ya, Ya Ya, Ya Ya Ya; . . . .” I knew those words but I had to listen more closely to the still unfamiliar musical homily. It grabbed hold of me as a neglected friend began stirring in me. I had to pull the truck over. As he rushed in like a hurricane, I realized that I had wandered and it had truly been too long . . . . I sat in that rest area and replayed it several times until the lyrics found room in my head and the song took up lodging in my heart. I spoke prophetically, “There is a lady with a future in the industry.” The rest of the drive home was much better. There were so many good tracks on ICHY that sometimes ‘Soul by Storm’ was neglected but it will always have a special place in my inventory. Ths other is this i know…it defines the foundation of my faith and how i look at the world.Thanks for the many years of great and uplifing music…i still hope to see you in concert someday! Seize the Day is a must! I heard it first way back when and it still strikes me as one that everyone needs to hear! There are many more that I love, but it would be my first choice. Plus, the contortions that I had to make to get this photo should make my request deserving of some consideration! Congratulations on 20 years…and here’s hoping for more than 20 more! 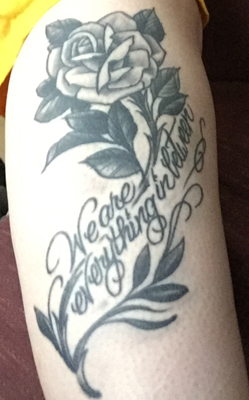 Yes, having a lyric become a permanent part of your body does earn bonus points in the voting! I am a ‘newbie’ to you and the song that hooked me was “Any Given Sunday” – LOVE your music and looking forward to this compilation to be released! Congrats on 20 years Carolyn! Still remember hearing Seize the Day for the first time on the radio while at the cottage. Lots of great stuff on that album including Reaching, Love is Always There and What I Wouldn’t Give. Liked Is Bethlehem Too Far Away as well. I hope multiple times voting is OK, because I really want to think about this; however, I do want to put in an early (and often) vote for my beloved “Do We Dare,” which is not only an often-overlooked gem of the oeuvre (I’ve heard rumors that the songwriter herself has had to look up the lyrics before performing it), but is also a song that expresses that deep-seated, universal grappling with the divine mystery in a way I’ve never heard any other song attempt. And, I think, it succeeds with power and beauty. Seeing this for the first time, these come to mind immediately: “Reaching”; “One Syllable Words”; “There You Are”; “The Last Word”; “Surprised By Joy”; “Travelers”; “Dance Like No One’s Watching”; “Any Given Sunday”; “The Power of Love”. And here’s perhaps the only vote for “When I Consider”! Hey, Daniel – you should be writing my press kits. Thanks for the great description, and the suggestions too. I always go back to your first album, the WHOLE album. It has helped me in various times in my life. Particularly, ‘I can hear you’, ‘Seize the day’, and ‘Love is always there’. You are an amazing artist and I feel lucky to have connected with you through your music and Facebook. Please keep it going! Thanks, Cory – I’m glad we’ve connected too. An acoustic arrangement would be great for “One-Syllable Words” because having that in your pocket might lead to its being played in concert, even without percussion. Plus, it was inspired by the great GKC (or, at least, I’ve always assumed it was). “Wasteland” is a haunting song and a long-time favorite. The PA-version is so epic, but I would be curious to hear it re-imagined — maybe to showcase the hope-filled last verse. And, of course, once more: “Do We Dare” — best song ever! Thanks for letting us vote! Have fun in the recording studio! I can hardly wait to hear what comes out of it. Input duly noted, my friend! You performed at Live From Studio B twenty years ago, and I was there. You have continued to inspire reflection. These are some of my favorites. Haven’t thought about “Altar of Ego” in years – thanks Christy! I’m thinking of songs that may get overlooked, and might speak to a younger generation because they’re upbeat songs about choices and freedom. 20 years? Your fans were born after your first album! Ouch. Where does the time go? Your songs have given me peace and joy in sad times and happy times. Thanks for the memories. I would say Reaching, New Year’s Day or maybe Power of love. I would love to hear you redo one of Rich’s songs like Jacob and 2 Women or Peace. Thanks, William. Rich was the best and I still love doing his songs. I’ll probably only do my own originals on this project, but I’d love to do an “influences” project down the road and Rich would definitely be on it. SEIZE THE DAY…story…lyric…rhyme…poignant…inspiring…I listen to it often…to be inspired all over again! “Reaching”. At a seemingly hopeless time in my life, our study group was going through Jan Meyers’ “The Allure of Hope”. As I was reading the very words to “Reaching” quoted in that book, the song started playing in the background from our 110-set CD player set on shuffle. It was a huge “God is here!” moment I still recall 12 years later. Amazing encouragement. What a cool story – thanks! I’m going to suggest some songs that I think might sound quite different in the acoustic duo format, and I’d like to hear them. I also suggest number 3 because I don’t hear it played much nor do I see it on YouTube. It was the 2nd of your songs I fell in love with, right after Seize the Day. “Reaching” has always been my favorite song of yours. It’s already an acoustic track, so possibly redundant on this album. “Do We Dare” is a close second. Thank you for continuing to share your heart, and for blessing us. You really can’t go wrong. I do think One Syllable Words would be great pared down. Call Me Crazy, Do we Dare, and Dare to be Happy would all get my votes. I also really like the idea of the “lost” verses to Seize the Day. Father, Thy Will Be Done – Please, please, please!!! The first song I ever heard of yours was “Reaching”. I had just joined a new church, it was an emotional time, and a good friend chose this song as her “special” that Sunday morning. I was so moved, it brought so many good memories to mind, and I immediately needed to know who recorded that song. When I found out about Carolyn Arends, I was hooked! This song will always have a special place in my heart! Some other top songs for me are “Do Not Be Afraid”, “Don’t Forget Where You Came From”, and “What We Hope For”. I have never been privileged to see you in concert, but would love to soon!! And, I reiterate others’ previous comments…congratulations on 20 wonderful years of ministry, and here’s to many, many more…cannot wait for this new project!! Love “Travellers (The Airport Song)” & your rendition of “They Will Know We Are Christians”. It would be interesting to see how your voice would sing the Randy Stonehill song, “Hope of Glory”. Looking forward to the acoustic best of. Blessings! Even if those don’t make the cut, I’m eager to hear this new project! Since you were 4, Jordan, really? This is simultaneously thrilling and horrifying. 🙂 Thanks for the time put into thinking about this, and the list. I will, ahem, look into the B-sides. And if you’re considering a cover song . . . Thanks, Mark. I was thinking about “King of Hearts” and considering a project where I just record songs that have influenced me over the past 20 years … might be a fun future project. I’m going old skool — my choices are all from the 20th century. “Reaching” — Yes, one could argue that this is already acoustic, since piano is often regarded as acoustic. But I think it would be interesting to replace the piano with stringed instrument(s). “Do What You Do” — Just because this was the first song we heard where “folk meets rock and nobody gets hurt”. “We’ve Been Waiting for You” — The parallel that you draw between human birth and the believer’s arrival in heaven (upon human death) just slays me. Thoughtful rationales (and some good memories) – thanks Brendt! With so many great compositions, how are we supposed to choose? I’m going to go with What Love Looks Like. No, wait, There You Are. Nope, changed my mind again. D’oh! Wait a minute. Are we missing the obvious? Celebrating 20 years should be ….. you got it . . . . 20 songs! Two decades . . . . 2 CDs. Brothers and Sisters, let us pray. And OK – Soul by Storm is borderline acoustic already, but I still would like to hear it on the album, Pleeeease. Mrs. Arends, you are overall my favorite artist of all time (yes, even surpassing the Beatles overall). I must say I await each album eagerly, and I am so pleased to hear of this project. I would like to put a strong vote in for Under the Gaze. This is literally my single most favorite song of all time (and I share this opinion with many people). This song more than any other “sums it all up”. You have many great songs, but I hope you will consider Under the Gaze as a (no…THE) single most essential song to include in your album. Thank you so much for your musical, lyrical, philosophical, and literary contributions. You have truly had a greater impact on many people’s lives than you may ever realize. Thank you again! Quite a compelling argument, Mike – thanks! Would LOVE to hear “not a tame lion” acoustically, although the fiddle does sound amazing…. good luck transforming it! Hmmm – interesting idea, Cindy – thanks! Glad you found the right spot, Janice – thanks! 1. Reaching and Seize the Day– the first of your songs that I heard. I was hooked! 3. No Trespassing — love this one — It is the great shame of our society that we don’t trespass a bit more — everyone has the right to drown — but Jesus wouldn’t let them so why should we? 4. Free — goes along with the one above. I love the gritty truths and they need to be shared and pointed out in a way people can hear. 5. My Favorite Lie — It points out that we all have our favorite lies/pieces of unwillingness and we are letting truth get watered on. 8. Love You Out Loud — good reminder for those with us and resonates for those who are not. 10. Great Cloud of Witnesses — This gives depth to the idea of the race — “Sometimes I just lay on the road on my back….” Haven’t we all felt that way. How great to know that we do have a great cloud of witnesses…. Moses, Abraham, Isaac and people we’ve known…. Ummm, is there a limit? Love the rationales, Amy – thanks! Thanks for the thoughtful list, Brian! What a wonderful blessing to eagerly anticipate and await! Thank you for the music, Carolyn! We saw you live/met you in Marion, IL with Rich Mullins “la, la , la la, la la” (1996). [I once played with Roy Salmond among Lutheran Youth in Illinois (1984 or 85) The Jolly Beggar broke a string and borrowed my Martin to finish the set!] Your song “Reaching” has blessed me more times than I can count, “maybe that’s what heaven is for.” Thank you! Story of Stories. My Favorite Lie. What in the World. You have been playing with my favorite people and blessing us throughout. “Take it easy, but take it.” ~ Pete Seeger God bless and keep you! Reaching from the I Can Hear You album, wonderful and imaginative song! When I Can Hear You was released, I was blown away by the whole album. But I had, and continue to have, a unique experience around the song “Reaching.” I’m an album guy, and almost always listen to complete albums from beginning to end, hoping to get a bit more of the experience the artist intended. So I almost never listen to a single song repeatedly. But when I first heard to “Reaching,” it strongly touched a part of my heart that had rarely been exposed, and rarely is still, I suppose. I listened to that song over and over again, during my spare time over a number of days. Even 20 years later, and 20 years older, I think I still have each little piece of that recording memorized. I see quite a few others have requested this song, too, so a lot of your listeners must identify with it. As others have said, the original is already pretty much acoustic, but I bet that you and Spencer (and thank you for introducing me to his music, too) could cook up an arrangement that would impress. Hmm, I’m already hearing Spencer’s mando on the intro…. I agree with an earlier post that suggest that for 20 years it should be 20 songs. Of course that could be just because “Everybody Wants Everything”. I am sure that I am “Not Alone” in this but of course also understand that this might be a case of “More is Less”. I have listened to your music for most of your career and try to regularly remind myself to “Seize the Day”. This latest project is a wonderful way to reflect on these 20 years and when I heard we got to vote and that the release would be free I thought to myself “This is What Love Looks Like”. When so many songs have touched you in so many ways it is hard to suggest just a few so as you select your songs I simply pray “Father Thy Will Be Done”. Okay I know that for most of these I have been “Reaching” but I really do pray that you will “Go With God”. I had hoped to come up with something better but sadly “What We Hope For” doesn`t always go “According to Plan”. Seriously Carolyn – thanks for your music – it has blessed, inspired an challenged me often. Blessings to you and yours. Bonus point so you, Mark Webb, for clever incorporation of song titles! I can’t imagine that Seize The Day won’t make the cut… And my ‘other one’ vote goes to Fragile. Duly noted (and the suggestions above), Ms. Knechtel. Thanks!! I give thanks to God often for you and your great stewardship of your gifts. Keep writing and singing, Carolyn! Thank you, Clarence. The idea that “Come Anyway” was meaningful around your ordination just made my year. Pax Christi. This is awesome news. I can’t wait for another album of yours. I still remember when I first learned about you. I actually won a contest on the radio and received tickets to your concert near Seattle. I went not really sure, but I left amazed! Your songs spoke to me! I have met you a few times (even at a fair concert when weather wasn’t great). Every time I meet you I feel blessed. Thank you for sharing with me! Thanks again for sharing your talent with me! I can’t wait for the next 20 years of listening to you! Hey Mary Anne – I’m glad you took the chance in Seattle! Thanks for the suggestions. “I Can Hear You” has always been a favorite for me. And no ‘best of’ would be complete without “Seize the Day” and “Go With God”. Can’t wait to hear the finished product! I heard you (& spencer!) for the first time just this past Sunday & I already have so many favorites! Plus EVERYTHING else I’ve heard. Thanks, Karen – so glad we got to meet on Sunday! Using your criteria…songs I want the next generations to know, and ones that were very significant in my own life and the life of my kids when they were teens. Thanks, Marj – hope you’re doing well! Wanted to take the time to do this cuz I love your music and lyrics Carolyn. So hard to pick. Here are a few I’d like to hear again! New Years Day- For some reason this album doesn’t play nice on my players. I also noticed the mix wasn’t really clear on the site either. Maybe a good one for a remix. Be still- definitely a fave. My favourite lie- also a fave- so much truth in there, a good reminder for all of us. Who you are- might be interesting acoustically with some kids or a choir singing the “who you are” part. Was there a limit on how many? You’re asking the impossible to narrow down the best 10 songs in a 20 year span. Your song writing ability is par none. First song that is a must for me is “Cease the day”. I remember you walking out on stage with your guitar in hand and singing that song in Halifax, NS. I turned to my friend who ran a Christian bookstore and told her way back then that you carried something very special. I followed your career from that day and have always been amazed by what you produce. Another song I continue to listen to is “Willing”. Still stirs me to this day. “Never Say Goodbye”, “I’ve got a hope” … no matter what you choose Carolyn, we all win. Thanks for sharing your amazing talent with us for the past 20 years. Praying for another 20 years of great music from you. Blessings. Thanks, Wanda! I bet that performance in Halifax was almost the full 20 years ago, eh? It would have to be considering I’ve been pastoring at this present church for 20 years this August. You were with Ray Boltz and the new comer Rebecca St. James. If you are ever planning to come east (Cape Breton) there’s an open door for you here. You have given us so many terrific songs to choose from and in looking them over I discovered there are still a few that I have never heard before. For that reason it would be cool to see something from one of your first albums redone. Still, my favourite songs would have to be There You Are, Who You Are, Dance Like No One’s Watching, What We Hope For, This is the Moment, and Do Not Be Afraid. Seize the day will always have a special place in my heart as well. For all these songs, their messages have been timeless. While others have had more meaning during different seasons, these ones continue to be great reminders of hope, joy, and courage. Thanks Stephanie – for the suggestions, and for the encouragement. You Take my Soul by Storm! And Seize the Day – of course! Thanks, Bruce. I’m surprised by how many have mentioned “Soul By Storm” – I’m gonna have to learn that song again! I’m probably the only fan who thinks Seize the Day is perfect as it is and doesn’t need to be released yet again. There You Are – when I performed a special song at a church, the CD player wouldn’t play my own track. So I grabbed the worship leader’s guitar and sang There You Are. Happy – I sing this in the shower. New Years Day – I used the song as an example in my Toastmasters speech for the new year. Just Pretending – I just like the title. No Trespassing – I liked this song the first time I heard it. Thanks, Tony. Nice to hear of the spontaneous performance of There You Are! Those are my top 2 favs!! Have fun sorting through the votes! And a HUGE thank you for continuing boldly in His calling in your life. Your music, lyrics, and writing have been instrumental in my walk with Him. Thanks, Erin – it’s so encouraging to hear what you’ve taken from the songs! Thanks, Mike. Fun that I get to be in your vehicles with your family – are we going anywhere good this summer? I remember Ronn coming home so excited about this new artist Reunion had signed. He said, you are going to love her! He was right! I remember him asking my opinion on which radio single should come out first since I was your demographic at the time. I was pregnant during that time and I would listen to your album everyday on the way to work and Jaden would always kick during Reaching, so I would play it over and over. I remember thinking, I can’t wait until she has kids so she can write about motherhood. And then later…We’ve Been Waiting for You. I’ve always loved your honest walk with the Lord and how you reflect it in your music. May God bless you and Happy 20 Year Anniversary!!! Aw, thanks Michelle. Does this mean you have a 20 year old? How is that possible?! He will turn 20 this year! I know, it’s crazy! For the record, my 3 favourite are “In Good Hands”, “Even The Wallflowers”, and “We’ve Been Waiting For You”. in the hospital, and head home late each night, waiting until he could be home with us. I remember listening to “We’ve Been Waiting For You” every night driving home, anxious but so excited about welcoming him into our family. Both of our parents lived out of province, so it was just the two of us sharing that amazing experience, and that song will always have a special meaning for both of us. Ps. “In Good Hands” is timeless, in my opinion. I remember hearing my friend Spencer Welch play an amazing cover of that song. Beautiful song. Thanks, Colin. We had our kids at the Royal Columbian too. I’m really moved to think of you driving home from the hospital listening to “We’ve Been Waiting For You.” Thanks for sharing. I could just put down all of them but that would not be practical. I considered answering the “human equation” question with XIV. Just for giggles. You are up on your roman numerals, right? Away back in the dawn of time you had a song that Spencer had cards with drawings on them, I think to keep up with the words of the song. What was that? By the way, that takes us back to 1997(?). And how come you don’t look any different? The cards! That was for Everybody Wants Everything. A formative memory for me, too. Saw them at Carolyn’s first Creation Festival. The song that got me hooked on Carolyn Arends music was Seize the Day! Thanks for weighing in, Heidi! “We’ve Been Waiting For You” gets my vote. It holds a special place in my heart. I played the song for my first child as I put him to bed in our home for the first time–after years of waiting. I am not ashamed to admit shedding many tears of joy. Even more than the sentimental start to the song, the brilliance of the last verse showing our entry into heaven in the same way really makes this my favorite from your amazing catalog. And thanks for the 20 years of fun! Nice cross section of eras, Andriah – thanks! Thanks for doing this! How to choose??! “Under the Gaze” is I think one of your strongest songs, and giving it an acoustic treatment will be a real challenge, its scope is so majestic and symphonic. So, good luck! My sentimental fav’s are “In good hands”, “We’ve been waiting for you” and “Reaching” – but the recorded vers’s are pretty acoustic already. OK, let’s round it out to 5: “I can hear you” always makes me feel happy happy happy – would love to hear that done acoustically! Thanks, my crazy Aussie friend! NOTHING CAN SEPARATE, I’VE GOT A HOPE, GETTING READY FOR GLORY, WHO YOU ARE, SEIZE THE DAY, SURPRISED BY JOY … and MY FIRST CHRISTMAS (which closely connects with my own mom’s life, born in 1923, gave her heart to Christ as a young person, and celebrated her first Christmas in heaven in 2013. Thanks, Rollie – and, though I’m sorry to hear about the loss of your mom, it’s neat to hear about the parallels. Love the vibe and message in the song “Happy”. This song has personal meaning for me. Also, love “The Power of Love”. Thanks, Jane. I’m surprised to see how many votes “Happy” is getting. That makes me … happy! “Big Deal” or really anything from the “Feel Free” album. That album is the most “plugged in” and it would be nice to hear an acoustic treatment of some of those songs. Thanks, Bob. I do hope we’ll get to Portland one of these days! “Do Not Be Afraid,” “She’s Getting Ready for Glory,” and “In Good Hands” have provided spiritual and emotional sustenance to me on the road during key challenges of my life. So I vote for them, even if I can’t play bass on this album as I’d like to…. 20 years of amazing songs with substance! “New Year’s Day” and “Feel Free” are my votes. How about a duet with Amy Grant?? 2 of my favorites, together (on record) at last!! I don’t know if “Do What You Do” has been overlooked, but as a song that makes a compact case for living life without fear (or at least living it as if fear were not a factor), I certainly want the next generation to be exposed to it. I hadn’t thought about it until you mentioned it, but an acoustic version of that song could be quite lovely. Thanks, Jean. That song has come up a fair bit in the voting … interesting! Father, Thy Will be Done — although I love the “middle eastern” feel of the original version, maybe expand on that concept? Such thoughtful suggestions, Janice – thanks! I would also like to hear some of the tracks though from Feel Free, stripped back but with the same energy – Father, Thy Will Be Done would be a lot of fun to hear acoustic and has such a cool vibe, but also one or two of the other full band tracks from this album such as Do What You Do, Feel Free, This I Know and Last Thursday – I am hoping for songs that aren’t already acoustic on the original album. Then from the newer albums Be Still and Something Out Of Us from LWHF and Something To Give and Everybody Wants Everything from PA – great arrangements on the original albums and a pick from these could sound great stripped back on an acoustic project and would sound quite different to the originals. Looking forward to hearing the final track listing! Wait…what’s this I hear about Pollyanna B-Sides??? I want to spend my American money on them! I won’t go into rationale for every choice, because all the songs mean so much to me. These are perhaps (perhaps) my 10 favorites, in no particular order. Thank you, Carolyn. The world is a better place because of you, and the Kingdom is more evident. You should have told me sooner that AMERICAN money was in play … (LOL) – Seriously Brett, thanks for the suggestions, and for your very encouraging comments at the end. I know I’ll be Surprised by Joy in what everyone else picks….I love them all! I also love “Nothing can Separate”. –We’ve been waiting for you – God really used this song in my life, when my daughter was about 6 weeks pregnant, and my mom died after a long illness. The imagery is beautiful, and it was a great comfort to think of Mom being welcomed into heaven in the same way we welcome our little ones when they are born. Thank you for your years of ministry in music, and I hope there are many more! Thanks for the list, Kathy, and for the glimpse into your life around “We’ve Been Waiting For You.” Wow. xo. Carolyn, like all the others who have commented here, I have been deeply encouraged by your music throughout the years. “I Can Hear You” came out at the beginning of my adolescence, and it gave me words to describe my wrestlings with who I was, who God is, and how life works. Over the years, your songs and your writings have continued to speak to the reality of life in an “already and not yet” world. Thank you for creating the space for questions and faith to coexist, and for reminding us that we can trust the God who is holding us all in the midst of it. I believe the next generation needs these things too. While I could make a case for so many of your songs, the ones that have resonated the most with me in such moments are “Reaching”, “All Is Well”, “Do We Dare”, “In Good Hands”, “It Has To Be You”, “Not Alone”, and “Nothing Can Separate”. I realize most of these are already fairly acoustic, and therefore may not be the best fit for the project, but I wanted to acknowledge their meaning in my life. I know that whatever you choose will be wonderful and will encourage many more hearts. Congratulations on 20 years so far, and blessings on the future! Aw, thanks Laura. Your encouragement goes straight to my heart. Looking forward to this project. Love, love, love your music! Thanks so much for doing this. No matter which 10 they are going to be fantastic. But I sure hope “Getting Ready for Glory” and “Travelers” make the cut. If voting is still open, my husband wants to put in a vote for an update on “Travelers” aka “The Airport Song” that includes cell phones and something about being manhandled by TSA. Thanks! If there was ever a guy qualified to vote or “Travelers,” it’s your airline-executive hubby. Duly noted. 1. Seize the day – amazing song, inspirational in that it inspires me to get off the couch and use my talents for God. If I had to only listen to one song by you for the rest of my life, this would be it. 5. Father Thy Will Be Done – Your performance of it at House Of James should be enough evidence to record again acoustically Great song! 6. Willing – A wonderful song of Faith and obedience. 7. It Has to be you – Considering the personal experience you had that led to the song, how can it not affect others too? You have many more great songs that connect with me. I chose ten that either connected with me the strongest or that I think would have an even greater impact in an acoustic setting. Thanks for writing songs (and the book, which I am re-reading). Know that God is using you and your talents more than you can imagine. Do We Dare: gotta back up Justine on this one! It’s Out of My Hands: this is my go to when I need to be reminded that my way is not His way. This was especially poignant when I learned to be content in my job even though it was not the career path that I had planned for my life. I thank you and Spencer for the gift of this song. The Lord’s Servant: the fear, the immense joy, the willingness of Mary and Joseph. WOW! Hide and Seek: I know it’s not on one of the cds but it’s a beautiful song (love those B-sides). Go Somewhere With You: my road trip song! One change though…may need to consider swapping out the Texaco card for an Irving card. Looking forward to the “re-creation” of words and music that have touched so many people is so many different ways! Thanks, MK – good suggestions, good rationales! Actually, more than any Rich cover, I’d love for you to record your take of U2’s “Where the Streets Have No Name.” You introduced it as one of your favorite songs when you played at The Falls Church, Falls Church, VA, September 1997. It was a unique rendition that deserves to be heard. Hey Chip. Wow – good memory on the Rich tour. You’re right that I probably won’t do any covers on this anniversary collection. I’d love to do a “influences” album sometime soon – 10 songs from 10 artists who have been seminal for me – and there would be a Rich song on there for sure. In the meantime, thanks for the suggestions. I honestly can’t remember my set from the Mullins tour – you’re right that I did “Seize the Day” and I’m pretty sure I did “I Can Hear You” but beyond that I can’t remember! Hey Mike – So cool to hear about Street Lights – wish I could have heard your version of the song! Big Deal, Do What You Do but my fav EVER is THIS I KNOW :). It’s heavier music which is more appealing to a wider range of ages, more current with youth of today. It’s a great song that you just wanna keep listening to over and over again. Great lyrics and it’s not too heavy for those who aren’t into the heavier music. I am so excited to see you again at Camp Nakamun this weekend. I bought your CD’S as well as your book a couple of years ago also at Nakamun. I love your Seize the Day and Under the Gaze- and actually I do love ALL of your songs! for their meaning, the melody, your simple but sincere and sometimes imperfect stories that I can very much relate to. Thanks, Ting! Hope your enjoying Nakamun – I sure am. Make sure you come say “hi”! I love the song, “First Christmas”. Makes me think of my grandmother and now my mom who will be enjoying her first Christmas with the One she loved most. That’s so special, Margaret – I’ll be thinking of you and your mom this Christmas. xo. If I am right, I think the first time I listened to you was in Noah’s nook, but that was a long time ago. So my memory may be off. But the next time I saw you was on stage with Rich. I would like to suggest a simple idea. It’ been 20 years. How about revisiting the first album, “I Can hear You.” It’s still the one I like the most. Pick a venue or maybe three and do a live recording. Sell the video or put in on YouTube to promote the 20 years Live Cut Album. I think your fans would buy it in a heart beat. Thanks for the suggestion, Robert. And Noah’s Nook – wow – that was a while ago! This is a great idea. Thanks for doing it. 2 under the gaze. It leads us to a God who is intimately interested in our lives – just waiting for us, knowing we will turn to Him. Another great song. 3 travellers talks about how we go through life wonderful. And just to complicate my vote, according to plan. Have a good time choosing! Great project idea! My vote is for “Seize the Day”. It was our first dance at our wedding, still a wonderful memory after over 9 years. If there are extra verses, I’m voting for all of them too! Your lyrics often have such wise turns of phrase, sometimes they catch me after years of hearing them. Blessings on your project! For the next generation and for people who are not traditional Christians – I am a soul and More is less. I recently played I am a soul at Mum’s funeral – lots of none believers there, but they were blown away by it, so beautiful, one of the best. Hi Nicola – thanks for your votes. So sorry to hear about the loss of your mom – so honoured to hear you played I Am a Soul at her funeral. Pax Christi. Do We Dare, Reaching, Do Not Be Afraid, Is Bethlehem Too Far Away…. Hi, Carolyn! It was so hard to choose just a few songs, I almost missed the deadline! I love the newer songs, but it would be great to hear some the earlier songs remade. New Year’s Day is at the top of my list, and I would add Altar of Ego, Reaching and Seize the Day. The last 2 were the first ones I heard on the radio back when they were released and they resonated deeply with me and my situation at the time. 20 years sure went by fast! Thanks for all the beautiful music. God bless you. Wow. Your life song. That’s an honour! Thanks, Cindy! I’m going to have to throw my vote in for “Feel Free”, “Do What You Do”, and “New Year’s Day”. These are some of the “least acoustic” songs in your collection, and I’d really like to hear what your remake of them would sound like. Thanks, Todd. So cool to hear the song connected so strongly with you. I’d love an acoustic version of This is the Stuff, There You Are, We’ve Been Waiting For You, and New Year’s Day. OK, duly noted! Thanks, Suzanne. Two songs, First one is “Suprised by Joy” day my Daughter was born the second verse pop into my head.”Other day when I Kissed my son, I was blown away by what you’ve done, cause when he smiles at me with his toothless grin. It’s their I see your hand on him” After years of trying we were able to adopt my daughter and be their and take her home the day she was born. That song means so much to us. Thank you. My mother in law died suddenly and my wife requested this song. Thanks, Jill. That one might be a tough one, because we’ve already recorded that song twice. But your vote has been noted! My vote goes to I am A Soul – it just speaks to me – as much of your music does – thank you! I couldn’t resist adding some of my favorite songs to the list. hope I’m not too late. It’s a song that grows with me on my journey with Jesus.